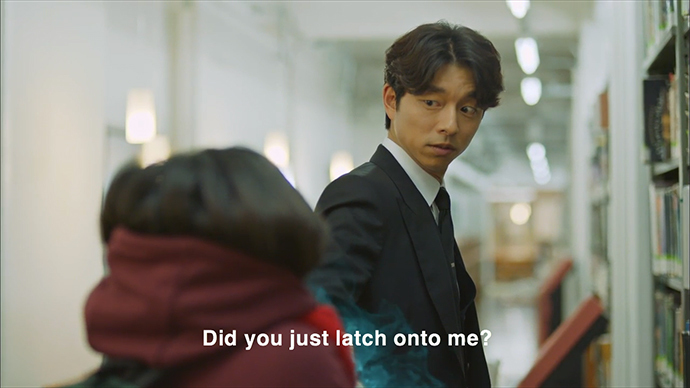 Drama Goblin, 쓸쓸하고 찬란한神-도깨비 is the recent hot topic in Korea. Boy, the drama is full of surprises. The suspense plot, witty conversations between Kim Shin the dokkaebi and the grim reaper, the movie-like scenes of Kim Shin’s life centuries ago as a general, all got me hooked on this drama. 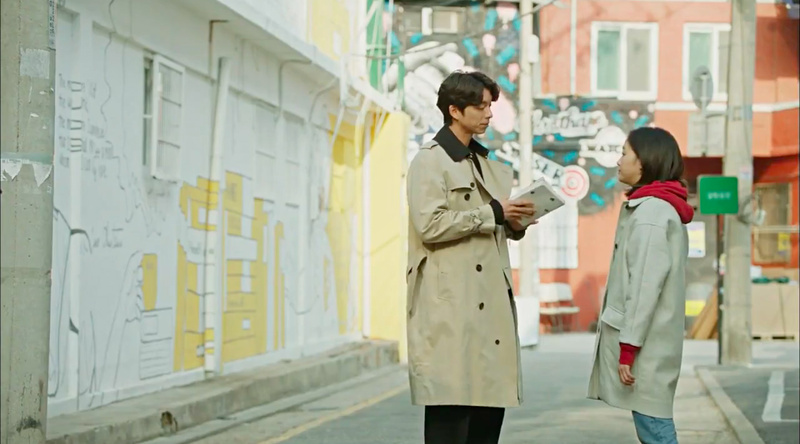 Since it has garnered so much attention from the public, both local and overseas alike, I’ve decided to gather all the filming locations of drama Goblin in this post. 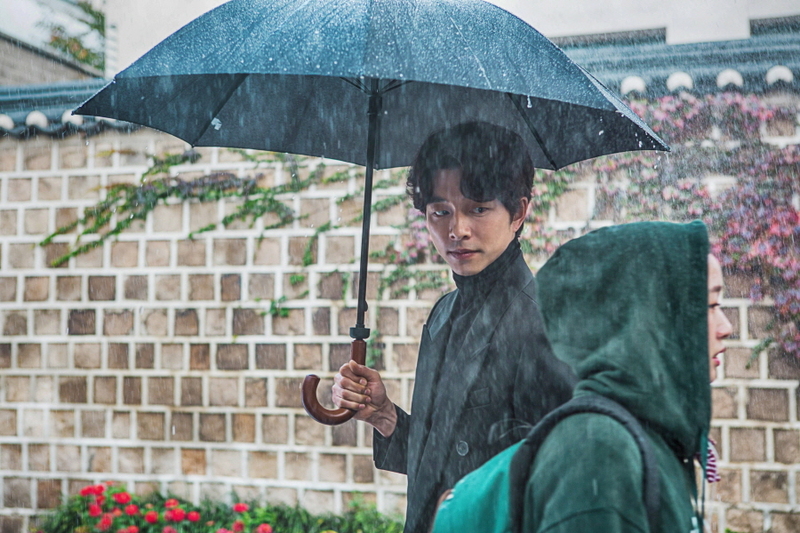 Photo courtesy of TvN Goblin Official Site. This beautiful, blossoming buckwheat farm is a secret hideout for dokkaebi (Kim Shin), and it is also the place where Eun Tak and dokkaebi had their first kiss! This lush buckwheat farm is located at Hagwon Farm 학원농장, the country’s largest buckwheat farm located in Gochang county. Expect to see rapeseed flower in spring, sunflowers in summer and cosmos in autumn. Hagwon Farm, 119-2 Seondong-ri, Gongeum-myeon, Gochang, Jeollabuk-do. 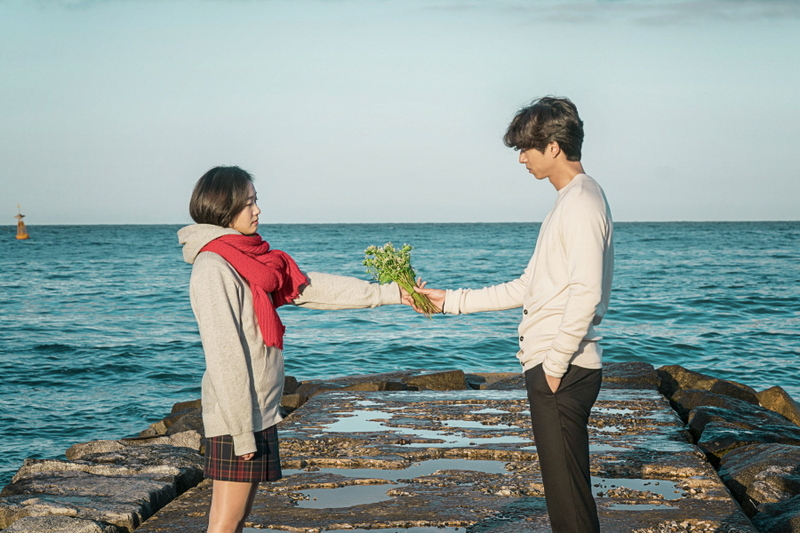 During the 1st episode, Ji Eun Tak inadvertently summoned Kim Shin for the very first time when she blows the candles on her birthday cake at a beautiful seaside. She then was gifted demanded Kim Shin’s buckwheat flower bouquet as her birthday gift. The beautiful scenery of Jumunjin 주문진 has become a popular tourist site after the episode went on air. People are flocking to the beach for photos that you may now need to queue before taking your photos. 81-32 Gyohyang-ri, Jumunjin-eup, Gangneung-si, Gangwondo. 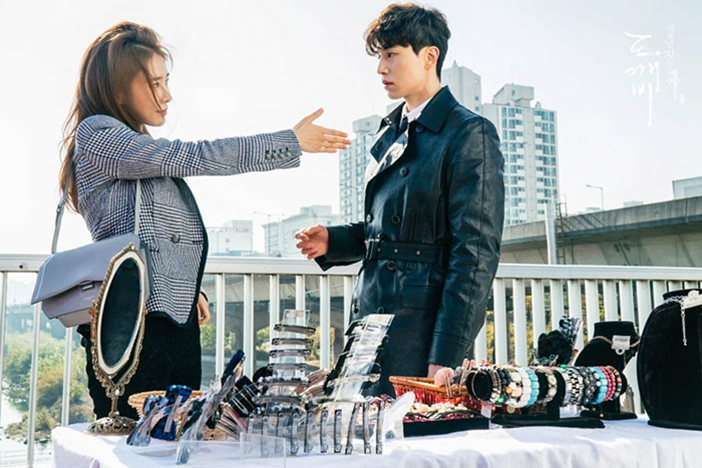 There was even a signpost that read “Muffler, flower and umbrella can be rented for KRW 1,000 each”, for visitors to recreate the drama scene. After much media attention, the signpost is nowhere to be seen. Fancy some interesting ice-cream? Surprise your taste buds with a squid ink ice cream available at the Jumunjin Beach. It was described to be sweet and savoury. Perhaps like salted caramel?! I have yet to try this out personally, though. 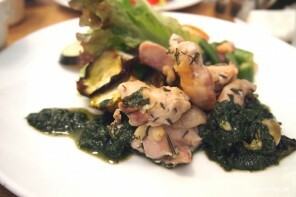 Jumunjin is also famous for its seafood dishes. Freshly steamed giant red crab (홍게), anyone? There are many good restaurants around the area, but Daeyoung Yoo Tong 대영유통 is the famous among all. I mean, look at that drumstick-look-alike crab craw, I am sure it is already making everyone salivate. Crabs eggs come in a dark green liquid form, and taste the best when fry together with rice. 대영유통, 강원도 강릉시 주문진읍 주문리 312-341. 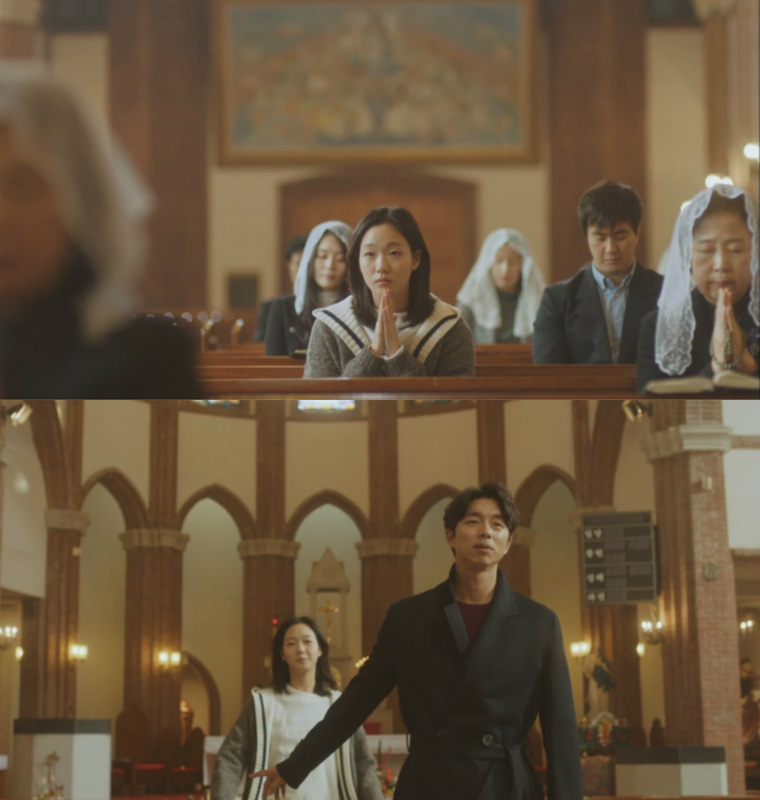 “What a beautiful church!” This came up my mind when I saw this scene in the drama. 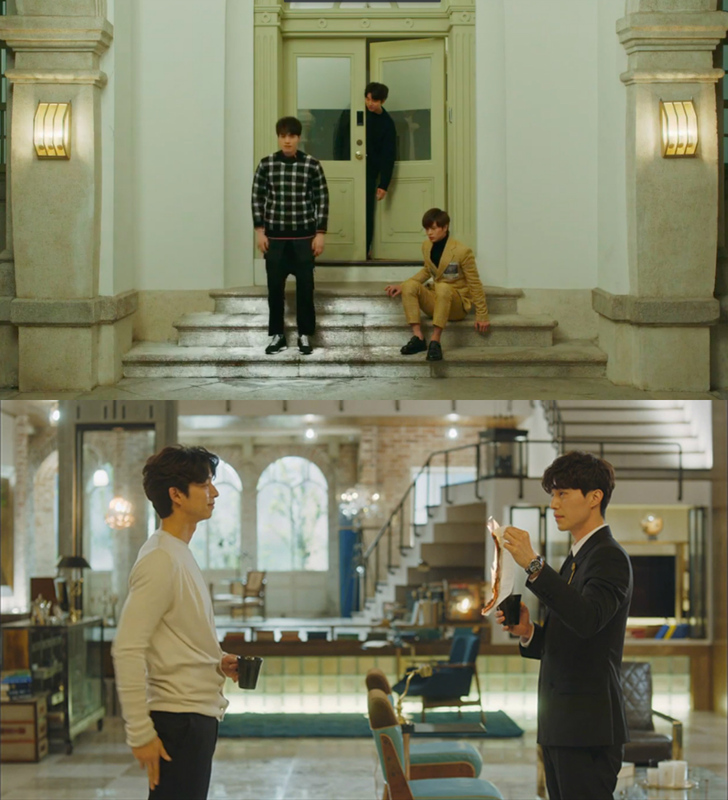 Eun Tak finally found the way to summon Dokkaebi and chooses this venue to see her beau. 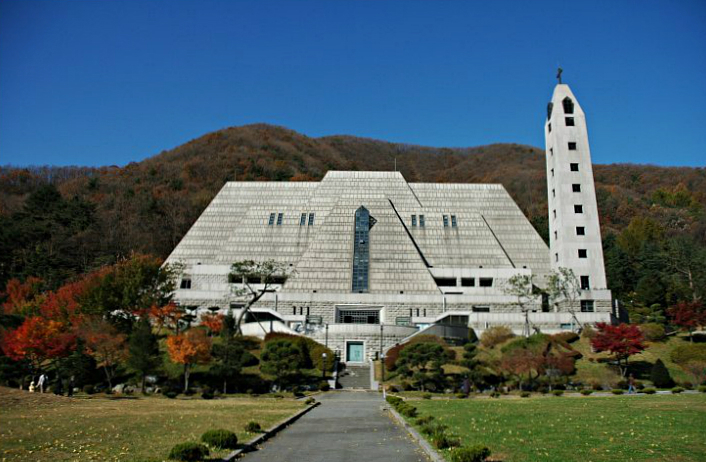 This scene is filmed at Mirinae Holy Site 미리내 성지, located at Anseong, Gyeonggi-do. This church was built in 1986 and was famed as one of the best church to visit during autumn as it is surrounded by a thick autumn foliage. 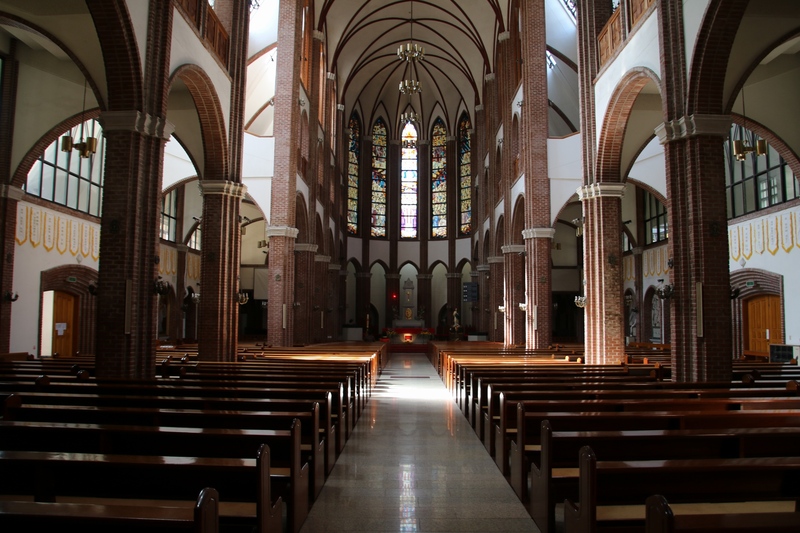 Interior of Mirinae Holy Church. 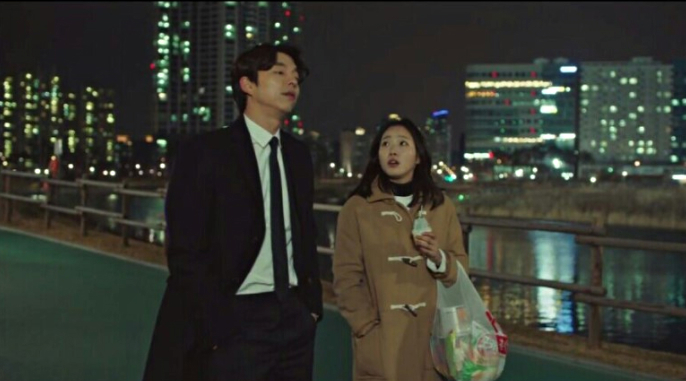 Quite a few scenes were taken at Incheon, including this one, the Cheongnaho Lake Park 청라 호수공원 where the alcohol intoxicated Dokkaebi reveals his secret to Eun Tak. Surrounded by high-rise apartment, it is a perfect place to enjoy a romantic stroll at night. 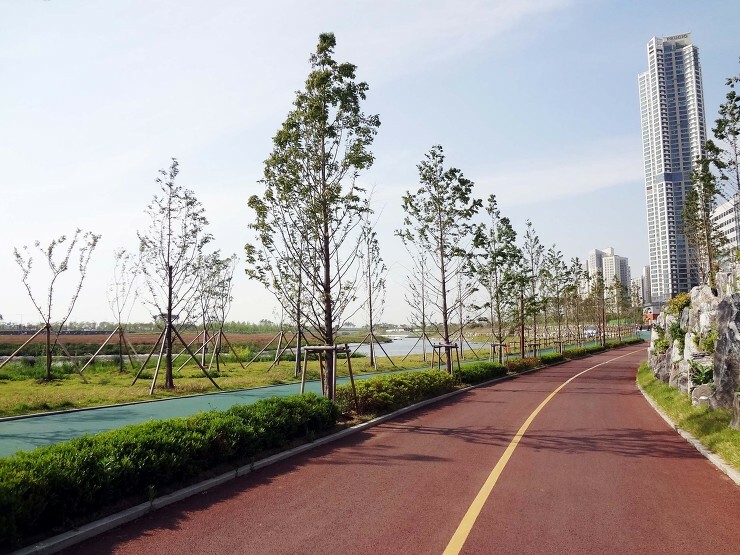 135 Cheongna Canal-ro, Seo-gu, Incheon. Chongnaho Lake Park in day time. 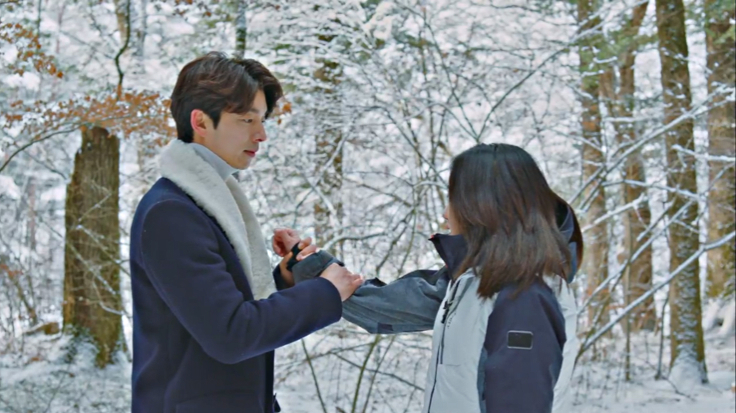 I was once again mesmerised by Korea’s snowscape at episode 9 when Eun Tak left Goblin’s place and started working at Pyeongchang-gun 평창군, a place famous for its ski resorts. Her arbiet (part-time job) was at Yongpyong Resort, one of the South Korean’s all-time-favourite ski resort. Pyeongchang is located at the north-eastern part of the country, which is considered the colder area in S.Korea. Expect to see an enchanted winter wonderland during winter, and enjoy the natural aircon here during summer. Team #JeoseungSunny would know this place best. 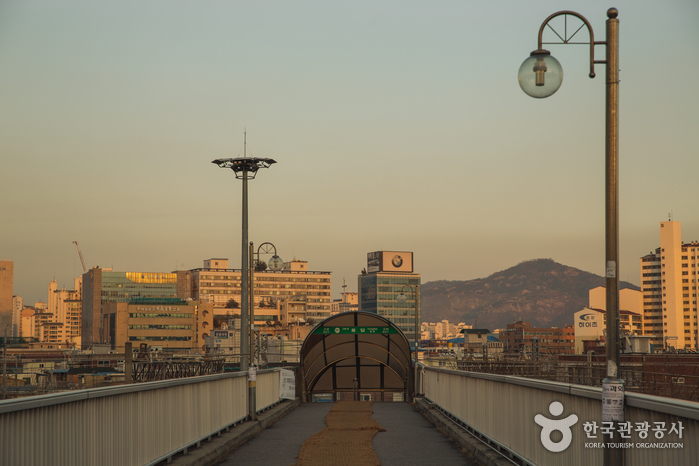 The fated encounter between the eye candy couple is filmed at Yeongdap Station Pedestrian Bridge 용답역 육교. A place where you can get a glimpse of ordinary life of local commuters. 2호선 용답역 2번 출구. 서울시 살곶이길 성동구 159. The exquisite looking house where goblin and grim reapers stays is filmed at Unhyeongung Yanggwan (운현궁양관), or the Unhyeongung Western House, located within the Duksung Women’s University (Jongno Campus). It is currently listed under South Korean’s cultural property, hence it is unavailable for viewing. However, you may still access to the surroundings of the building via the main gate of the university. All drama has its legendary, fated meeting-for-the-first-time between the protagonists. Eun Tak and Kim Shin’s was at Samcheongdong Doldamgil (삼청동 돌담길). There are many ways to reach Samcheongdong, and this doldamgil is located right at the usual route I would take to Samcheongdong. I like it because there are many things to see along the scenic route. 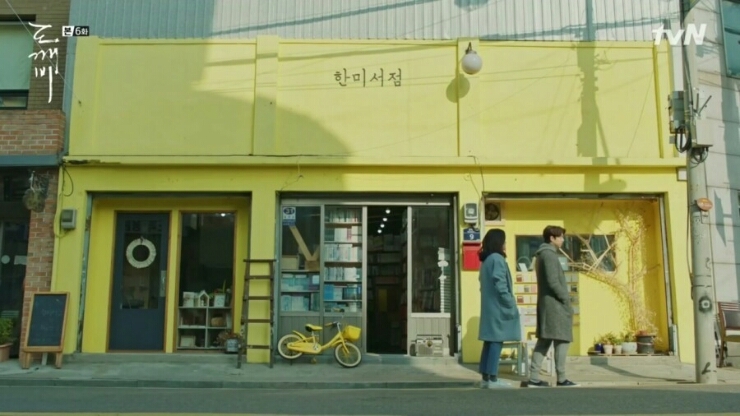 This yellow graffiti wall appeared in the drama where Eun Tak was blowing off the flames on her burnt squid snack and accidentally summoned the goblin. For those who’re wondering, this place is the same location where Kim Woo Bin filmed his Maxim coffee CF. It is called the Mocca Bookstore 모카책방 and was demolished after the filming. You may still see the graffiti at the location, though. Eun Tak’s school is really beautiful, isn’t it? It is not a filming set, but a real, functioning high school located in Samcheongdong. I remembered visited the school a few times for model photo shoots, and the school looks exactly like what you saw in the drama. Visitors are not allowed during school hours, so be sure to come in a weekend. Jungang High School. 2015. Photo by Azri. Remember the scene where Kim Shin was annoyed by Eun Tak’s summoned to the school library? The location of all the library scenes was filmed in Duksung Women’s University Library. The library is open since 1955, with a collection of over 600 thousand books. The library also appeared in another popular drama “Reply 1988” (응답하라 1988). Ever wondered where was the small fried chicken restaurant where Eun Tak works as a part-timer? It is located at Gangnam! I haven’t tried their chicken at their new Olive Chicken Cafe, as I am always just a call away from my forever-love Kyochon. But if you’re all out for a Goblin themed trip, chicken and beer at Dae Cheong outlet is a must. Because nothing feels like Korea without fried chicken and beer. 687-2 Ilwon 1 dong, Gangnam-gu, Seoul. I really like this bookstore with the quirky yellow colour facade. It is actually a 2nd-hand bookstore located at a hipster area in Incheon. 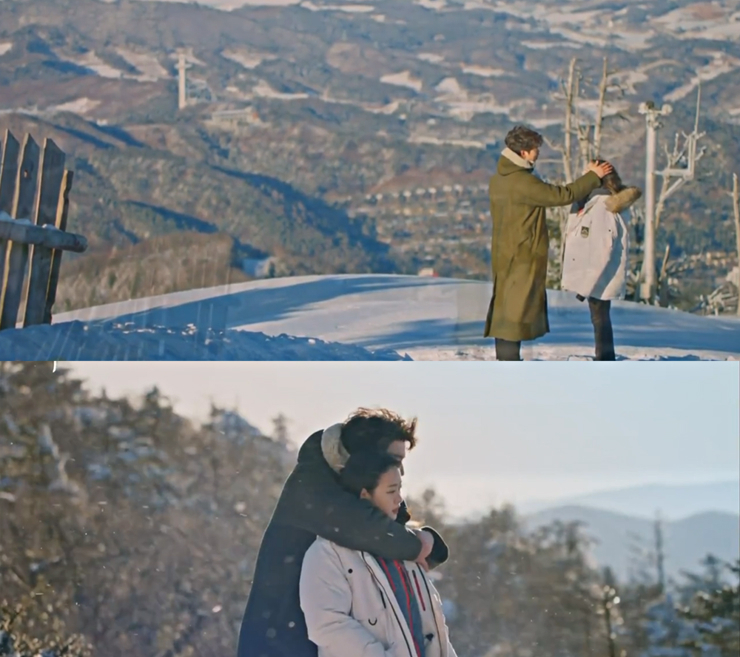 It is so real and beautiful, you may want to recreate your own Goblin drama scene, just like the Korean couple below. Have fun! Hanmi Bookstore, 14-5 Geumgok-dong, Dong-gu, Incheon City, South Korea. 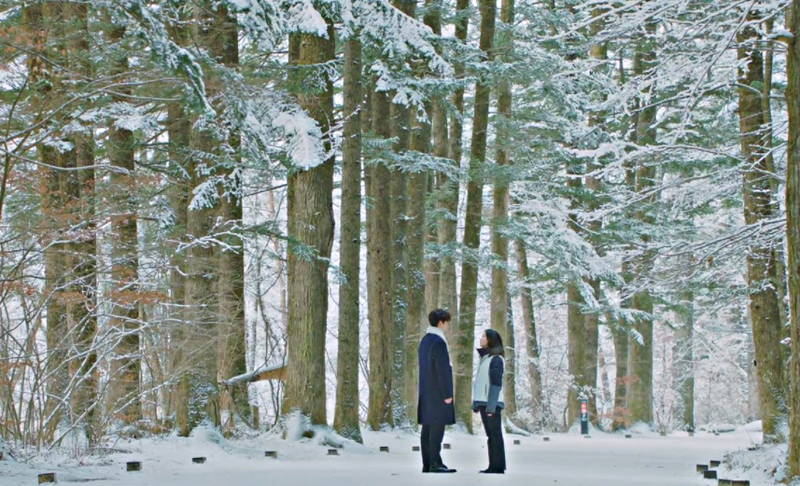 I was once again mesmerised by Korea’s snowscape at episode 9 when Eun Tak left Goblin’s place and started working at Pyeongchang-gun (평창군), a place famous for its ski resort. Look at the screen grabs again! The shots taken there are so magical, they make me want to brave the snowstorm and visit Pyeongchang right now. Many of the snow scenes were taken at Woljeongsa Temple 월정사, where its snowscape is known to be one of the best in South Korea. If you’re thinking of doing a temple stay during winter, I believe Woljeongsa is a good choice! 63-1 Woljeong-sa, Dongsan-ri, Jinbu-myeon, Pyeongchang-gun, Gangwondo. 월정사, 오대산 강원도 평창군 진부면 동산리 63-1.